Shanti Devi, a girl growing up in Delhi in the 1930s, spoke very little until she was four years old. When she did start talking, she alarmed everyone in her family. "This is not my real home! I have a husband and a son in Mathura! I must return to them!" This was India, so instead of taking their daughter to a psychiatrist for a dose of Ritalin, her parents told her, "That was then. This is now. Forget your past life. You're with us this time." But Shanti Devi wouldn't give up. She talked about her former family to anyone who would listen. One of her teachers at school sent a letter to the address Shanti Devi gave as her "real home" in Mathura, inquiring if a woman who had died there not too many years ago. To his astonishment, he soon received a reply from Shanti Devi's previous husband, admitting that his young wife Lugdi Devi had passed away some years previously, after giving birth to their son. 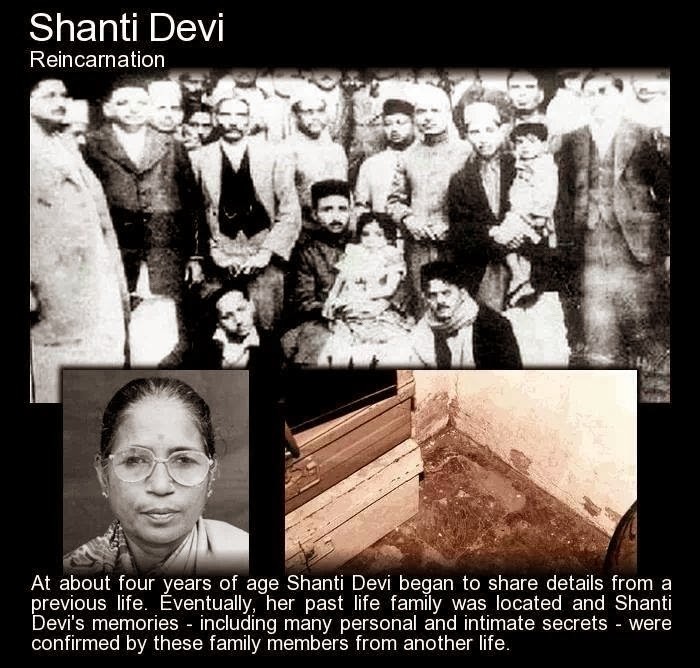 The details Shanti Devi had given about her old house and members of her previous family were all confirmed. This launched the most thoroughly researched investigation of a case of reincarnation in modern history. Everyone got in on the act, including Mahatma Gandhi and several prominent Indian members of the Indian government. A team of researchers, working under stringent conditions to ensure that Shanti Devi couldn't possibly be getting her information from any other source, accompanied the little girl to Mathura. On her own, she was able to lead them to her previous home, and correctly described what it had looked like years earlier before its recent refurbishing. She was also able to relate extremely intimate information, such as extramarital affairs of family members, that no one outside the family could possibly have known. The award-winning Swedish journalist Sture Lonnerstrand spent several weeks with Shanti Devi later in her life, recording her story and verifying information about the famous government investigation.